My brothers dohc 750 started leaking around the petcock handle. I resurected it for him after being stored for 20 years. It has the same non servicable riveted petcock as the newer sohc's. I found a new valve seal on eBay for $8 including shipping. The ears that the rivets go into on the valve body are made such that you can drill straight through them. Went to the hardware store and found the smallest machine screws and nuts I could find and a bit to match. I drilled off the rivet head and removed the faceplate and internals. Then I drilled through the ears on the body and put it back together with the nuts on the back side. Worked great and now it's servicable in case it ever needs freshening up again. 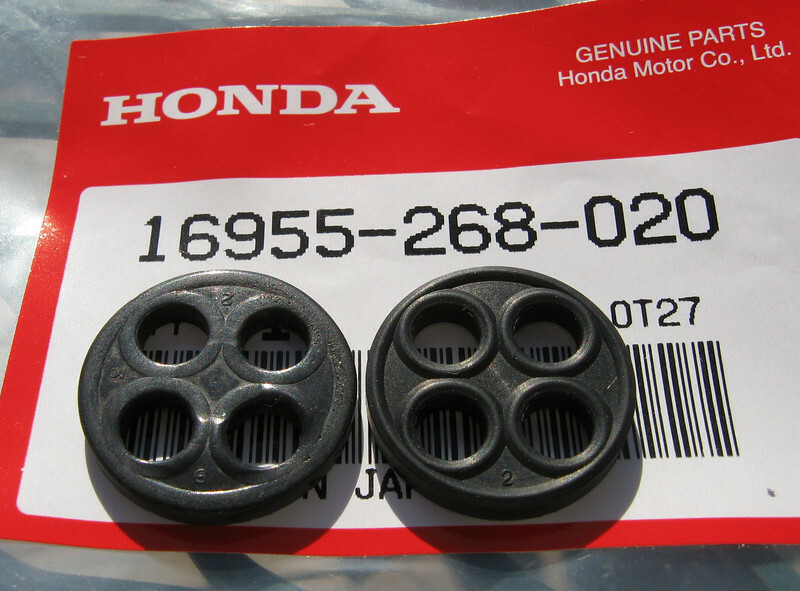 BTW, if anyone wants to try this, search eBay for "honda fuel valve". For some reason the seller doesn't mention petcock in description and it wont come up searching petcock. He says the seal is "about 20mm" That's the one. A real old school trick is to remove the seal and turn it over. The back is smooth and unworn. Found real friends here !!! I rebuilt my 78 Cb750F petcock, drilled the "rivet" and tapped the housing and used this gasket. One done one to go. Is it the gasket to be replaced? i did mine this way as well works great! i just took my time with the tap and it work! i'm realy happy to have a rebuildable petcock now! specially if you look around on ebay and find only NEW petcocks for $50+ way nice for about $10 fix! Thanks Lloyd, et al! My petcock was not leaking and all three functions still worked, but she would cut out or hit a flat spot with no recovery or rpm climb in 5th. Must have been sucking air into the fuel delivery. All that is history now! Thanks for the heads up, folks! Anyone know if this gasket will work for a 1982 Nighthawk 750? While doing refurbish on the GL1100, I found these petcock repair gaskets made in Viton rather than the rubber Honda uses. Rubber was fine for non-ethanol gas. But, elected officials/agencies removed that choice for many of us. Viton withstands ethanol. They are $16. But, I know of nowhere else to get them in Viton. Have you tried sirius? There are parts suppliers listed in the FAQ.